This item is typical of their range in 1/35; I have not seen the 1/72 and 1/48 scale offerings, but the 1/35 ones are very nice and relatively inexpensive for what the modeler gets. 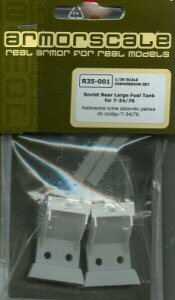 This is a pair of the rear fender polygonal fuel tanks from the late Model 1941 and most Model 1942 T-34 tanks with 76mm guns. The kit offers two exquisitely molded tanks in resin – the seams are wafer-thin but present on both tanks with no nicks or chips, and even have drain plugs molded into their bases – and a set of nickel brackets and resin bolt heads for mounting them to the tank. They also have excellent clear directions for assembly and installation. Thanks to Bill Miley for the review samples.